We’ve been sat on this for a little while now, so we’re excited to finally be able to share it. 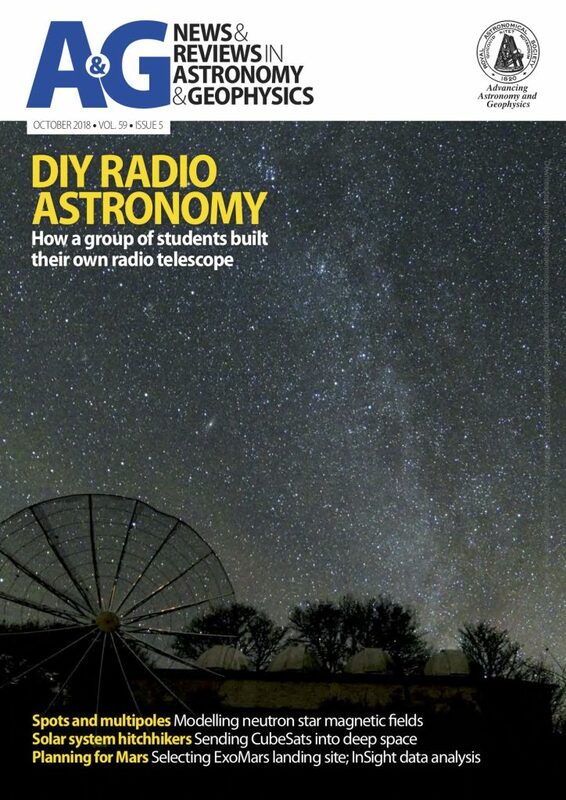 Earlier this year I was contacted by the editor of the Royal Astronomical Society magasinze, Astronomy and Geophysics, about writing a feature on radio astronomy and the XRT-C project. Additionally, we wanted to work in some information about UKSEDS as a whole and the fantastic work that’s being done at Caradon observatory. After some months of writing, and heroic amounts of patience from Sue Bowler, the editor of A&G, the article is finally in print in the October 2018 issue of A&G. It’s linked below if you’d like to read it. The other exciting thing is that not only were we featured in the magazine, which is already fantastic, one of the beautiful photos from Michael Bennett of Caradon Observatory was used for the cover. The phot shows a fantastic night time shot of the telescope and domes of Caradon observatory, with the Milky Way spreading out majestically above them. Many thanks to Michael for providing this photo for use in the magazine. This also means the project gets a large plug on the front cover, which is very exciting. I hope you enjoy the article. Let us know what you think.